– Dr. Joshua Tepper, President and CEO, Health Quality Ontario. Health Quality Ontario (HQO) is the provincial advisor on the quality of health care in Ontario, evaluating the effectiveness of health care technologies and services, providing evidence-based recommendations, reporting to the public on the quality of the health system, and supporting the spread of quality improvement throughout the system. 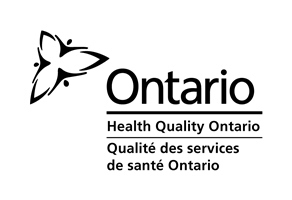 Health Quality Ontario’s research is published as part of the Ontario Health Technology Assessment Series, which is indexed in PubMed, and also published on the Health Quality Ontario website. Visit http://www.hqontario.ca for more information. Working with clinical experts, scientific collaborators, expert panels, patients and the public, HQO evaluates the effectiveness and cost-effectiveness of health care technologies and services. These evaluations are then presented to the Ontario Health Technology Advisory Committee (OHTAC), a standing advisory committee appointed by HQO’s Board of Directors. OHTAC’s purpose is to review, investigate, and advise on the uptake, diffusion, and distribution of new health technologies and the replacement or removal of obsolete health technologies. Its recommendations are then approved by the HQO Board of Directors, which has a legislative mandate outlined in The Excellent Care for All Act (2010). The Excellent Care for All Act aims to transform the health care system by creating greater public accountability, ensuring that executives, clinicians and health care organizations focus on quality, increasing the patient’s voice in the shaping of the system and using the best scientific evidence to drive change. In addition to conducting systematic reviews, HQO will continue to increase its capacity to deliver its appropriateness and quality-based procedures work.